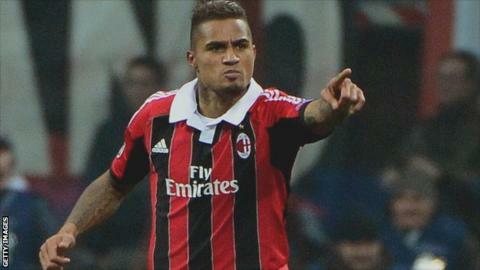 The Fifa President Sepp Blatter has announced he will hold talks with Ghana's Kevin-Prince Boateng later this month to discuss racism in football. The AC Milan midfielder made headlines when he led his team mates off the pitch after being racially abused by fans of fourth-tier Italian club Pro Patria during a friendly in January. After the incident, Blatter praised Boateng for taking a "strong and courageous stand" but added that leaving the field "cannot be the solution". Pro Patria were ordered to play their next home match in an empty stadium. The Ghana midfielder will visit Blatter at Fifa headquarters in Zurich on 22 March. Blatter, speaking in Edinburgh ahead of today's International Board meeting, also revealed that Fifa will be setting up a new anti-racism task force. It will be headed up by Jeffrey Webb, president of the CONCACAF federation of countries in north and central America and the Caribbean. Blatter said he wants a ``united front of the football community in our zero-tolerance policy against racism. ``It is a big, big problem also of education and understanding. We cannot do it alone, but we will do it because we have to kick it out of the game."